Escape the urban bustle at Palm Beach and Tamarama Beach. Manly Quarantine Station and Vaucluse House will appeal to history buffs. Get out of town with these interesting Manly side-trips: Bronte Beach (in Bronte), Captain Chocolate (in Jannali) and Barrenjoey Lighthouse (in Palm Beach). 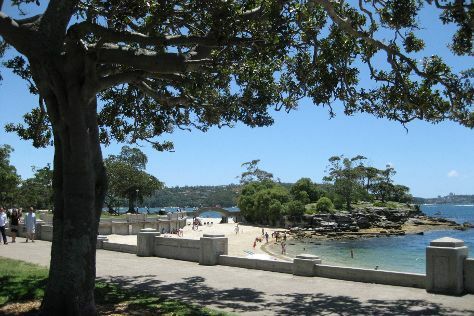 And it doesn't end there: kick back and relax at Balmoral Beach, Mosman, meet the residents at Taronga Zoo, tour the pleasant surroundings at North Narrabeen Beach, and don't miss a visit to North Head. To find other places to visit, more things to do, traveler tips, and more tourist information, read Manly trip itinerary app . Helsinki, Finland to Manly is an approximately 25-hour flight. The time zone difference moving from Eastern European Time (EET) to Australian Eastern Standard Time (New South Wales) (AEST) is 8 hours. Traveling from Helsinki in April, things will get much warmer in Manly: highs are around 26°C and lows about 17°C. Finish your sightseeing early on the 28th (Sun) to allow enough time to travel to Cairns. For shopping fun, head to Rusty's Market or Cairns Art Gallery. You'll enjoy a bit of beach vacationing at Palm Cove Beach and Trinity Beach. You'll find plenty of places to visit near Cairns: Palm Cove (Kayaking & Canoeing & Hartley's Crocodile Adventures). Spend the 30th (Tue) among aquatic life with a scuba or snorkeling tour. Spend the 7th (Tue) wandering through the wild on a nature and wildlife tour. And it doesn't end there: look for all kinds of wild species at Tablelands, Waterfalls, and Spanish Castle, choose your vessel at Shaolin Junk Cruises, take in the pleasant sights at Red Arrow Walk, and enjoy the sand and surf at Yorkeys Knob Beach. To see traveler tips, more things to do, other places to visit, and other tourist information, go to the Cairns holiday maker app . You can do a combination of ferry and flight from Manly to Cairns in 5.5 hours. Other options are to drive; or do a combination of ferry and train. In April, Cairns is a bit warmer than Manly - with highs of 34°C and lows of 26°C. Cap off your sightseeing on the 8th (Wed) early enough to travel back home.